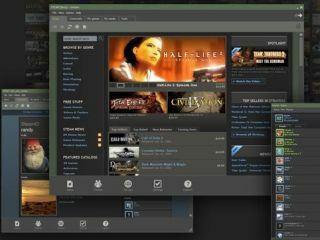 Valve has announced brand new version of Steam that it hopes will keep the PC from sliding into obscurity as a gaming platform. With Microsoft's attention seemingly drawn well away from PC gaming by its Xbox, it has been left to the likes of Valve to keep the flag flying for the PC, and the Half Life makers' Steam is the dominant game store/multiplayer/ social networking client around. So the news that a brand new version has launched with an immediate public Beta is major news for the PC, with new tools including better library management, achievement tracking and, intriguingly, swapping out the old Internet Explorer-based rendering engine for WebKit – the engine behind Apple's Safari and Google's Chrome. "We made hundreds of changes to the Steam client as a result of customer feedback on the interface, performance, and functionality," said John Cook, Director of Steam Development at Valve. "For example, we swapped out the Internet Explorer rendering engine with WebKit, which gives us a bunch of size, stability and performance benefits. This release of Steam leaves us well prepared for another year of strong growth." It's a timely boost for the PC, which still attracts millions of gamers for its first person shooters, real-time strategies and, of course, the MMO leviathans.